(Bloomberg) -- Crude advanced to the highest this year after a further reduction in supply from OPEC signaled that global markets are tightening. Futures in New York added 1.6 percent on Thursday to close at the highest level since November. 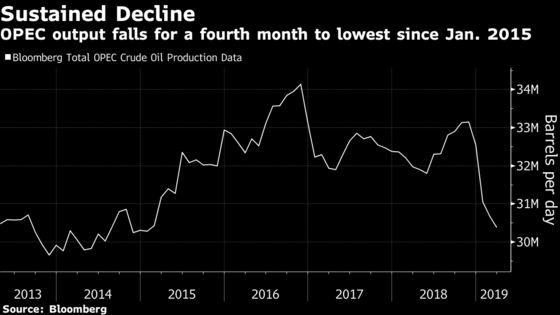 Declines in OPEC production are stoking optimism among investors as Saudi Arabia presses on with output curbs and power blackouts in Venezuela further squeeze supplies. Oil held its gains despite an industry report showing an unexpected jump in U.S. supplies last week. "The fundamentals that drove us yesterday -- the OPEC production numbers falling, Venezuelan production issues, strong manufacturing numbers and lower U.S. production -- all of that is conspiring to take prices higher," said Phil Flynn, senior market analyst at Price Futures Group Inc. in Chicago. Oil has rallied more than 30 percent this year as Saudi-led production cuts, together with receding fears over the global economic growth outlook, appear to be easing investor concerns. West Texas Intermediate for May delivery climbed 99 cents to settle at $62.58 a barrel on the New York Mercantile Exchange. It was at $62.55 a barrel in trading after the close at 4:52 p.m., despite an American Petroleum Institute report that was said to show a 3 million-barrel increase in U.S. crude inventories. Brent for June settlement added 36 cents to end the session at $69.37 a barrel on the London-based ICE Futures Europe exchange and advanced to $69.43 after the API report. The global benchmark crude’s premium over WTI traded at $6.76 a barrel at the close, the smallest gap since August. If the rise in U.S. stockpiles is confirmed by government data on Wednesday, it would be the second increase in a row and challenge assumptions that supplies are thinning. It would also contradict the 900,000-barrel drawdown forecast by a Bloomberg survey of oil analysts. Oil supplies may be even harder to predict than usual this week, after disruptions in the Houston Ship Channel late last month wreaked havoc on imports and exports. Parts of the shipping lane were closed following a fire at a chemical storage complex. Gasoline futures were up 1.5 percent in after-market trading at $1.9264 a gallon. WTI closed above its key 200-day moving average on Tuesday, a closely watched technical level. The WTI prompt spread closed at a discount of 3 cents, signaling a narrowing contango, a market structure where contracts in the near-term are cheaper than those further out. Russia fell short of its oil-output cut under the OPEC+ deal in March, even as the country deepened its curbs.